Excerpt of article originally published under the title "To Win – Attack." To win the war over its international standing, Israel must bring the battle to its enemies. Taking the initiative in war, and going on the offensive, makes victory more likely. This may also be true for the war over Israel's international standing. Israel's hasbara (public diplomacy) is usually defensive, focusing on our historical rights to the land and our legitimacy as a state – crucial issues, except that few care about them. 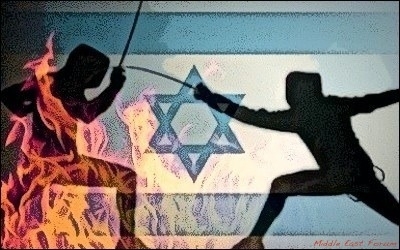 To win, Israel must bring the battle to its enemies, exposing their murderous nature, the danger they pose not only to Israel but mostly to world peace, nay, to the survival of the West and its values. The danger stemming from Israel's international isolation is, of course, not as imminent as the danger from a nuclear Iran or from an irredentist, Gaza-style Palestinian state. Still, Israel cannot ignore it. Political isolation can make a struggle with our adversaries even more difficult, while boycotts can cut our exports, which generate close to half our GNP, causing unemployment and social mayhem. To prepare for Israel's destruction, Iran is building a nuclear capacity, while all our other enemies are building support for Iran's genocidal plans by claiming that Israel deserves to be destroyed because it stole Palestinian lands and is guilty of ethnic cleansing. Iran and the Palestinians lead these murderous assaults on Israel but they are assisted by most Muslim states, by some European government and by mostly leftist radicals (led by Israelis and Jews), and by many NGOs, labor and church groups, academicians and public opinion molders. Israel must move from the defense of Zionism to an assault on the legitimacy of those who try to destroy it. Israel can foil such assaults, despite the many difficulties facing it in doing so. Studies indicate that most European citizens have no interest whatsoever in the Arab-Israeli conflict; they wish both would go to hell. It is therefore difficult to engage them and change their minds. Most of the assaults on Israel's legitimacy originate in the European chattering classes. They have become increasingly radicalized and they influence public opinion. They are immune to persuasion, because as is common in Christian society their attitude to Jews, and to the Jewish state, is not friendly. Most have been corrupted by Arab money. The Arabs purchased significant holdings in many major European firms. They exploit their economic clout to wage war against Israel. They help establish academic "research institutions" that promote the Muslim narrative, and sponsor all kinds of programs that influence politicians and the media. Arab governments lavishly fund Western academic institutions to promote anti-Israel narratives. Israel has to move from defensiveness, trying to justify Zionism as a virtuous liberation movement, to an assault on the legitimacy of the criminal regimes that try to destroy it. It has to expose them as dark and evil dictatorships that deny the human rights of their citizens, especially women, children, and minorities. It must clarify that their murderous aggression is not directed only at Israel but also at each other, that their wish to destroy the "small Satan" Israel is a prelude to their intent to destroy the "great Satan" America, representing Western culture and Christianity, which Islam is determined to vanquish. Their pretense of fighting for Palestinian rights is a facade hiding their genocidal intentions and their wish to destroy all non-Islamic peoples. If they could they would butcher all non-Muslims, as Islamic State (IS) is attempting to do. Israel does not do enough to make this case. It is time it did.